Generate a new PHA2 spectrum file for any LETG/HRCS-S grating observation to ensure that consistent calibration is used throughout the analysis. you are working with an HRC-S/LETG dataset and want to create a new level=2 event file and extract a Type II PHA grating spectrum file. Last Update: 29 Jun 2017 - Revised the note about detector edges. This analysis thread starts with the level 1 event file. Before beginning, users may wish to reprocess the data to create a new event file with the most recent calibration applied. Instructions on how to reprocess your data are available in the HRC Data Preparation Analysis Guide. If you are satisfied with the zero-order location, go directly to the HRC Grating RMFs thread. The contents of the parameter file may be checked using plist tgdetect. The tgdetect2 may also be used here; however, for HRC observations it always runs the tgdetect tool. Overlay the source list: Region → Load Regions → hrc_460_evt1_src1a.fits. If the zero order of the source is outside of the default search area (e.g. far from the aimpoint), tgdetect will not find it. If this problem affects your data, it will be obvious when the source list is displayed on the event file. In this case, run the Correcting a Misplaced Zero-order Source Position thread to identify the correct source position. Overlay the region file: Region → Load Regions → hrc_460_evt1_L1a.fits. Figure 1 shows the regions on the event file . The unusual syntax of the eventdef parameter; the tool will not access the predefined string if the leading ")" is missing. 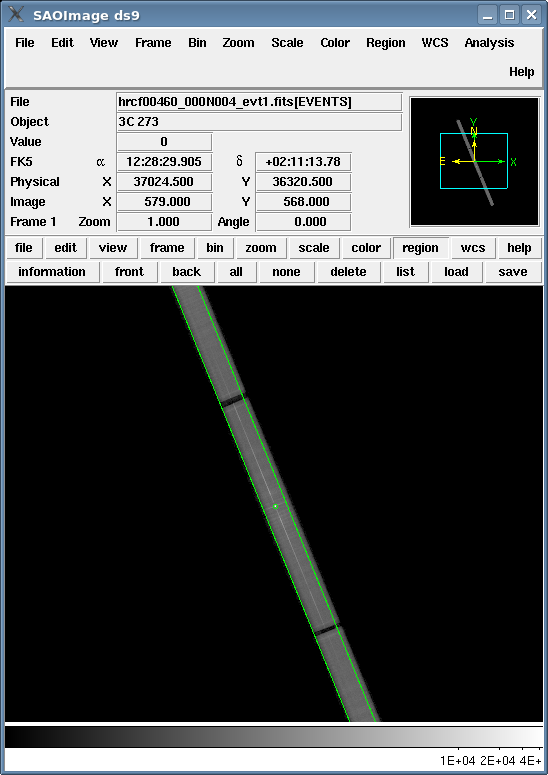 A new pulse-height filter for use with LETG data was released in CALDB 4.2.0 (15 December 2009). Over half of Level=2 background events can be removed at most wavelengths with a loss of ~1.25% of X-ray events. This is the recommended filter for use with all HRC-S/LETG data. The LETG/HRC-S Background Filter page has detailed information on how this filter was developed. After applying the GTI filter to the evt1a file, the DTCOR value must be updated to reflect the new GTIs using hrc_dtfstats; otherwise, the DTCOR uses the L1 GTIs found in the archive data, subsequently providing incorrect LIVETIME and EXPOSURE calculations. The event list header keywords, LIVETIME and EXPOSURE, must be editted, and is obtained by multiplying the ONTIME by the correct value of DTCOR. The Computing Average HRC Dead Time Corrections thread provides more information on applying this correction. The inregion_file needs to be set to "CALDB" (instead of the default value "NONE") so that the special bow-tie extraction region used with HRC-S/LETG observations is picked up. Electrical field-fringing effects on the ends of the three HRC-S segments create incorrect event positions and distorted pulse height distributions. Data processed prior to the May 2017 release of CALDB 4.7.4 (using HRC-S BADPIX map version 3) do not remove all the affected events; spectral features near the plate gaps should therefore be treated with suspicion. (inregion_file = CALDB)           Input region file. 27 Feb 2012 added link to HRC-S Event Position Errors Near the Aim Point webpage in the Overview. 16 May 2012 Include average dead time correction calculation as a necessary step of the reprocessing. 11 Dec 2013 Review for CIAO 4.6; added note about tgdetect2. 22 Dec 2014 Reviewed for CIAO 4.7; removed obsolete HRC degap caveat. 24 Feb 2015 Removed optional RAWY filter. Replaced with a note about enhanced background at the detector edges. 29 Jun 2017 Revised the note about detector edges.